January 11, 2018 | Liberty Corner, N.J. It was 2:30 p.m. on June 15, 2017, and the 22-year-old Texas A&M student waited on the tee with nary a morsel of food in his belly to absorb the nerves that had been building throughout the day. When the agonizing wait ended, he pulled out his driver and tried to block out the thousands of fans observing the action on the 492-yard, par-4 10th hole at Erin Hills during Round 1 of the 117th U.S. Open Championship. 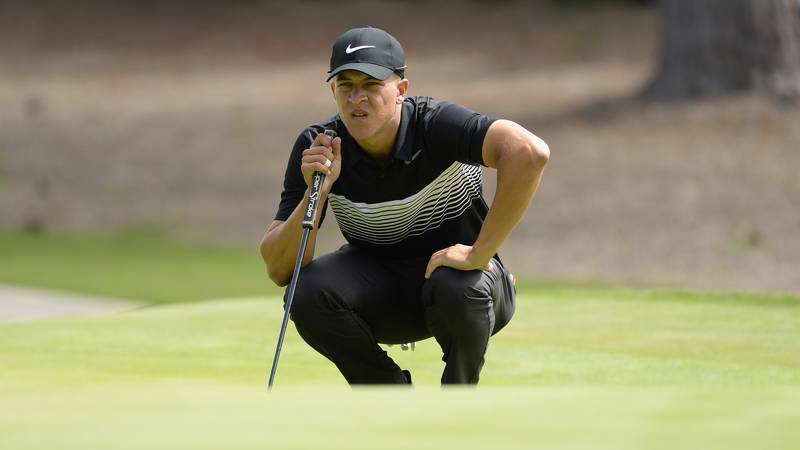 As calmly as though he were playing one of the public courses he grew up on in Sacramento, Calif., Cameron Champ crushed his drive 336.5 yards down the middle. And with that, he took a deep breath and walked down the fairway, the first steps on a path leading to a scintillating summer season on the amateur circuit that culminated in his first professional tour card. “Yeah, it’s safe to say that calmed me down quite a bit,” said Champ, recalling his first shot in a major championship. Champ’s road to Erin Hills was anything but calm. The son of a former minor-league catcher in the Baltimore Orioles’ system, Cameron inherited his father Jeff’s ability to punish a round ball. But Cameron knew around 8 years old that golf was the game for him. When he was 15, Champ met well regarded golf instructor Sean Foley, who was just starting to work with Tiger Woods and now coaches 2013 U.S. Open champion Justin Rose. Jeff Champ arranged the meeting in Florida through high school friend John Wood, who was caddieing on the PGA Tour for Hunter Mahan. Foley was working with Mahan at the time and agreed to observe Cameron, who warmed up on the range while Foley finished up another lesson. It was then that Foley got a sneak preview of what many others would experience when watching Champ for the first time. The two hit it off right away and in Foley, Champ had his first true golf instructor. His game soared. Always a long hitter, Champ refined his game and came out of virtual obscurity on the junior circuit to become a two-time Rolex Junior All-American and earn a scholarship to Texas A&M University. Unfortunately, Champ’s college career was derailed by injuries. It wasn’t until his junior year, in the fall of 2016, that Champ finally started to establish his form, posting four top-five finishes and an individual victory. Full of confidence from a successful college campaign and free of doubt that his body would fail him, Champ joined 9,484 hopefuls in filing an entry to compete in the U.S. Open at Erin Hills. For the vast majority of golfers who dream of playing on golf’s grandest stage, the journey consists of a two-stage qualifying process: 18-hole local qualifying followed by 36-hole sectional qualifying. Perhaps no one represented the “open” nature of the U.S. Open more than Champ in 2017. Of the 156 players at Erin Hills, more than half (79) earned their spot via qualifying. Champ was one of 21 players to advance through both local and sectional qualifying. 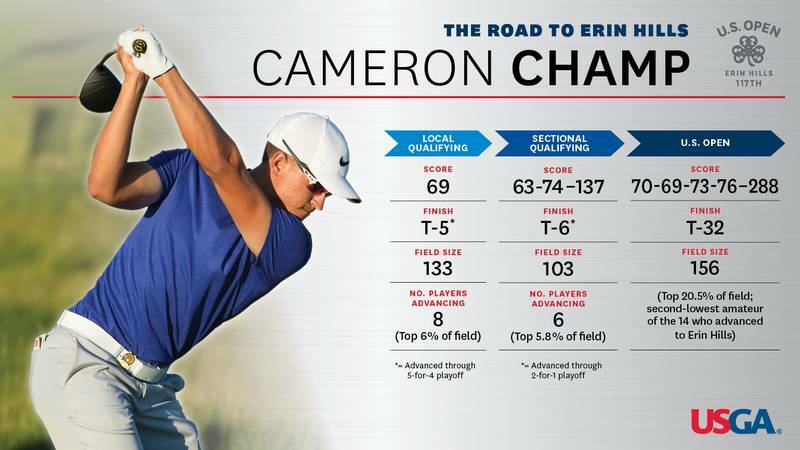 For Champ, the qualifying process started on May 9 with local qualifying at Wolfdancer Golf Club in Cedar Creek, Texas. In a field of 133, the top eight players would advance to sectional qualifying. On the 18th green, Champ stood over a 5-foot putt that he was convinced he needed to make. He missed. Then he had to wait two hours to learn his fate. Fortunately, his 3-under-par 69 earned him a spot in a 5-for-4 playoff. When two players before him hit their tee shots way offline, Champ was able to play cautiously and secure his spot in sectionals. But stressful 5-footers weren’t done with Cameron Champ. Playing in the Newport Beach, Calif., sectional qualifier on June 5, Champ set the world on fire in his morning 18, shooting a blistering 63 at Newport Beach Country Club to sit first at the midway point among 103 players vying for one of six spots at Erin Hills. But Big Canyon Country Club didn’t play nice in the afternoon. At 1 over through 17 holes, Champ again faced a 5-footer on No. 18. Just 5 feet stood between him and a dream that so few golfers get to realize. Again, he missed. This time, the playoff stakes were higher: He had to better Stanford University standout Brandon Wu mano a mano for the sixth and final ticket to Erin Hills. Fortunately, Champ had a chance to atone, as he replayed the hole in the playoff against Wu. Feeling his adrenaline was running hot, Champ clubbed down off the tee and ended up with the same yardage into the green. This time, he executed the approach he wanted and was left with a 30-footer for birdie. He got a break when Wu hit his approach into virtually the same spot, only a foot farther away. When Wu hit his birdie try dead-center but just short of the hole, it revealed the line and speed for Champ’s attempt. “All I was trying to do was put a good speed on it and if it went in, it went in. Luckily, it went right in the center,” he said. Then, he blanked amid the madness of the moment. One week later, Champ trekked to Wisconsin with his family and Jake Goodman, his caddie and college roommate at Texas A&M. Champ was immediately taken by the enormity of the scene. On the longest course in U.S. Open history, however, the unknown Champ would soon turn the tables and earn plaudits from the golf world. It started on Sunday before championship week, when Champ was paired with Louis Oosthuizen, who won the 2010 Open Championship at St. Andrews and tied for second in the 2015 U.S. Open. After a brief introduction, Oosthuizen teed off, followed by Champ, who unleashed a dart that defied his modest 6-foot frame and wiry-strong physique. Experienced with playing among the biggest hitters in the game, Oosthuizen found himself at a loss for words. A Monday round with 2011 U.S. Open champion Rory McIlroy provided Champ his first “wow” moment of the week, and he also played a few holes on Tuesday with two-time U.S. Open champion Ernie Els and Branden Grace, who contended in the 2015 U.S. Open at Chambers Bay. One of the best drivers of the golf ball in the world, McIlroy was impressed by Champ’s distance and offered up some advice that would help Champ for the week to come, and beyond. Champ took the four-time major champion’s words to heart. He kept hitting driver. And he kept hitting it into the fairway. After that nerve-filled opening tee shot, Champ shot 3 under over his first nine holes and finished 2 under on the day and in a tie for 18th, averaging an astounding 349.4 yards on the two measured drives in Round 1. They asked and he answered with more and more prodigious drives. Although his scores fell to 73-76 over the final two rounds for a strong even-par showing – Champ missed out on low-amateur honors by one stroke to Scottie Scheffler – the golf world was still abuzz as he paced the field in driving distance, averaging 337.3 yards per rip. He made an impression on Xander Schauffele, who played with Champ during the first two rounds and also rose out of relative obscurity to grab headlines at Erin Hills. Less than two weeks after draining a 30-footer to get into the U.S. Open, Champ now had to regroup for the summer amateur circuit. But after arriving at Erin Hills as someone few casual golf fans had heard of, he was leaving as someone to watch. Foley witnessed firsthand the excitement Champ brings to the game at the practice area at Erin Hills. Foley was sitting with a friend in the grandstand as a man nearby explained to his wife, an apparent golf novice, what the players were doing. Champ arrived on the practice tee and pulled out his driver. As important as Champ’s performance in the U.S. Open was, it served as more of a beginning marker for Champ’s accomplished summer, as he contended in several of the game’s premier amateur events. His summer break was punctuated by a spot on the USA Walker Cup Team in the prestigious biennial amateur competition between the USA and Great Britain and Ireland. Champ’s selection to the 12-player team was welcomed by USA captain John “Spider” Miller, who was immediately impressed with his game and his temperament. Champ went 1-2-1 in the Walker Cup Match at The Los Angeles Country Club, pairing with 2014 U.S. Junior Amateur champion Will Zalatoris in a Sunday foursomes win as the USA romped to a 19-7 victory. Champ returned to Texas A&M after the Walker Cup and competed in one fall event for the Aggies and three PGA Tour events on sponsor’s invitations – the Safeway Open, the OHL Classic and the RSM Classic – missing the cut in each. A little over a week after his final college event, Champ focused his attention on Web.com Tour Qualifying School. Exempt into Stage 2 of the three-stage qualifying process due to his U.S. Open showing, Champ fired a final-round 68 to finish tied for 11th and advance to the final stage. Four days later, on Nov. 7, Champ turned professional and went back to work with Foley to prepare for the final stage of Q-school. Champ posted four rounds in the 60s to easily finish among the top 45 at Whirlwind Golf Club in Chandler, Ariz., in early December. Making that top 45 guarantees Champ full status during the first segment of the Web.com Tour season. Champ is scheduled to compete in the first two events of 2018, back-to-back tournaments in the Bahamas beginning Jan. 13. He is unsure of his schedule afterward. In the meantime, he plans to take two online classes to complete his degree in sports management. Wherever his professional path takes him, Champ cites his U.S. Open experience as the catalyst that made everything possible.